1/ Combine the dry spices (powdered onion, powdered garlic, paprika, sugars, oregano and salt) in a bowl. 2/ Coat the turkey breast with olive oil and sprinkle it evenly with the dry spice mixture. 3/ Program the application to a customized setting of 200°F/60°C and insert the meat°it probe into the thickest part of the breast. 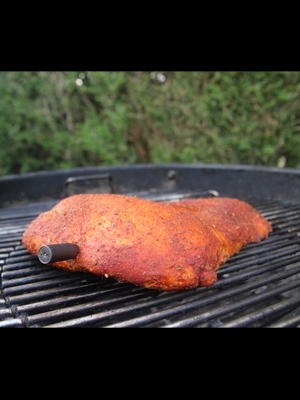 4/ Pre-heat the oven or smoker to 230°F/110°C and put in the turkey. 5/ Once the program sounds the end of cooking time, take the turkey breast out and dress it on a platter with sauce of melted butter and apple juice. 6/ Cover the platter with aluminum foil and program the application to the “Turkey” setting. 7/ When application sounds the end of cooking time, program 10 minutes of standing time.